Star Fox was the first 3D polygon videogame for home consoles, something at the time believed to be the preserve of the home computer and arcade markets. The second game was equally groundbreaking, introducing force feedback to videogames in the form of the Rumble Pak. 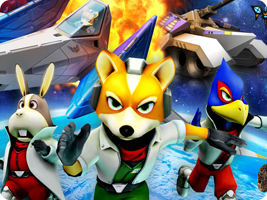 You control Fox McCloud, accompanied by his Star Fox team of adventurers-for-hire, as they fly through the Lylat System against the forces of the evil Emperor Andross.